Achillie Castiglioni’s Dry Cutlery design has been chosen by the London Design museum as one of the top designs over the last 25 years. This list also included the iPod and the Freeplay Windup radio. Achille died in 2002 and is still considered one of the top industrial designers of our time. Made of both polished and matt stainless steel, this work designed in 1982 continues to have an effect. Cutlery as functional art? Yes indeed. Silverware that you can use? That you can put in the dishwasher? That is hard enough that the edge won’t dull or the pattern wear down? The amazing process of making these by hand results in silver that is much tougher than machine stamped silverware. They have some nice patterns and offer custom work as well. Oh, one last benefit is less polishing! 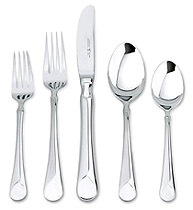 Minimalist design in flatware is where it’s at right now and for good reason. The fancy shmancy silverware days of yore are behind us and we welcome our utilitarian overlords. David Mellor’s “Minimal” is lean and mean. The fork and knife are functional and the design flows. The spoon on the other hand is more of a ladle and doesn’t fit well. For a better spoon and something a little less minimal check out his “London” design.